Watch Us Now on YouTube! If you’ve never picked up a mooring buoy, also called a mooring ball, it can be a bit daunting the first time; especially if you many onlookers. Read these 9 steps to picking up a mooring buoy so that you understand the procedure and then consider the 14 tips below to avoid making common mistakes. 1. After locating a mooring field, or bay filled with mooring buoys, determine if the buoys are private or for public use. Also determine if there are any weight or length restrictions – often buoys are color-coded (white might be private but yellow could be public), provide restrictions and/or have phone numbers written on them. Information prior to arrival can often be obtained from pilot books, plotters, maps, cruiser guides and cruiser websites. 2. 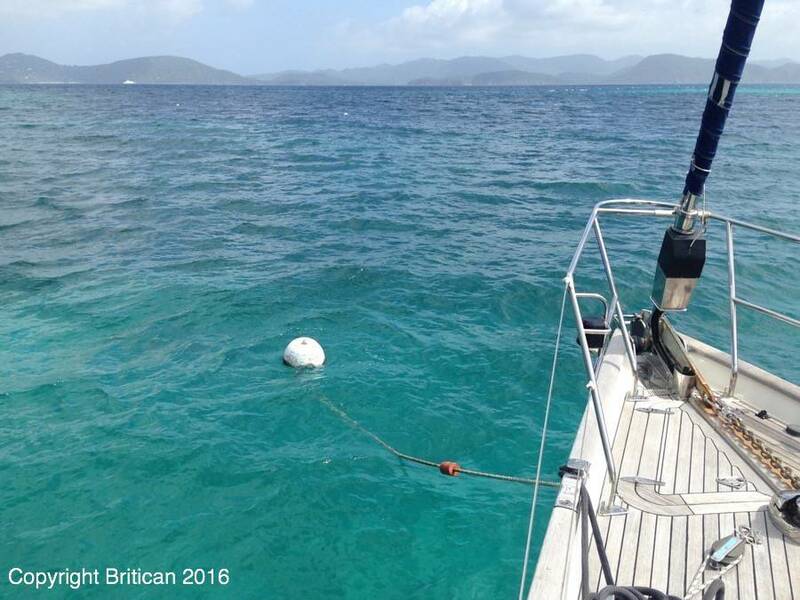 Before entering a mooring field, take note of any empty mooring buoys and pay attention to how other boats are lying at their buoys. If there are no other boats to visually inspect, make a note of wind direction and the flow of the current. You’ll want to aim into the wind or the current when picking up a mooring buoy. 3. Position a crewmember at the front of the boat, preferably with an extendable hook. 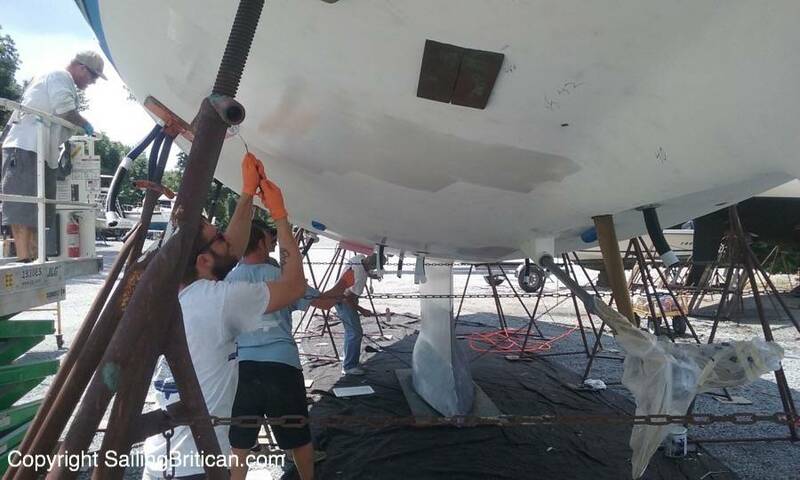 Also ask them to attach a line each to the bow’s port-side and starboard-side cleats reminding them to make sure the line goes from the cleat away from the boat and then back over the guardrail (in preparation). 4. Approach a free mooring buoy in the direction that surrounding boats are laying. If there are no other boats, head into the wind or current (whichever is stronger). 5. Ask the forward crewmember to count down the distance between the bow of the boat and the mooring buoy while using verbal clues or hand signals to indicate the boats direction. (Remind the crewmember to aim his or her voice towards the back of the boat so you can hear him or her). Note that the port line goes through the eye and back to the port side. Vice versa for the starboard side. 6. Shift into neutral when you feel the boat will drift close enough to hook the mooring buoy. 7. The aim is for the forward crewmember to grab the attachment located on or near the buoy (often it’s loop), hoist it up to the bow, slip at least one of the lines through a pennant eye loop and back through to the same cleat. When the weather is calm, there’s often enough time to slip the other line through the eye and bring that back to it’s same side. 8. If only one line is put on, the boat will be held in place however it will be lopsided. The second line can be added by using the engine to create slack, pulling the loop back up and inserting the second line. You can also drive your dingy to the bow to install the second line. 9. Once both lines are attached, the crewmember then needs to make sure the boat is as close to the mooring buoy as possible, so to not encroach on other boats in the field and that each line is equally looped back so the boat doesn’t lay lopsided. If the weather is heavy the use of the engine might be required to create slack so the ropes can be tightened. 10. To leave a mooring buoy, the forward crewmember waits for the helmspersons ‘go-ahead’ and then he or she unties one side, pulls the line in and then the other. Once all lines are in, the crewmember instructs the helmsperson on where the buoy is, so to not run over it, and the helmsperson exits in the safest manner possible. Note that the port side rope goes down to the loop and back to the same side and vice versa on the starboard side. 1. We position a third person midway between the helmsperson and the forward crew to help with communications. We’ve also seen other couples that use hands free head sets to provide instructions to each other. Within the cruising community they’ve been aptly named ‘marriage savers’ and it reduces the shouting that happens without them. 2. Never do you want to use only one line to affix your boat to a mooring buoy due to redundancy purposes. Lines can easily chaff and by having two lines affixed the chances of coming unhooked are drastically reduced. Furthermore, if you use only one line chances are that another boater will visit you and ask for you to add another line – especially if you’re lined up to hit them if you come unattached. 3. If possible, dive on the mooring line and make sure that the integrity of the rope and ‘anchor’ – usually a cement block – look in tact. In many areas of the world, mooring buoys are not serviced or maintained. It’s important to find out what you’re tying your boat to! 4. 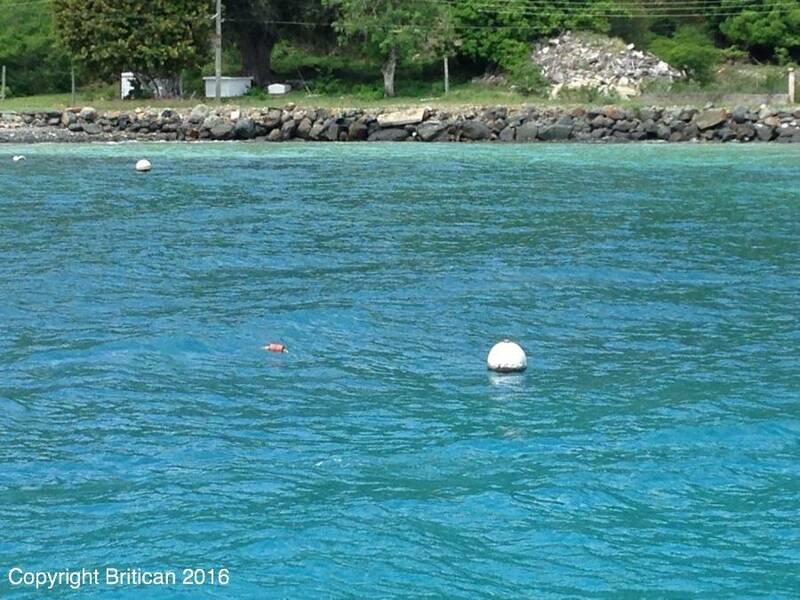 There is no local or international standard for mooring buoys. One bay will have buoys with long ropes and easy to lift pennants and others will have heavy buoys with only a metal ring at the top! In some cases it’s impossible to pull the buoy up to the deck to tie a line on. When that happens, make a very large loop with one of your lines, throw it around the whole buoy and tie the line back to the boat. Make sure that the wind and/or current keep the line tight and then drop your dingy or jump in the water to physically feed the unused line through the metal hoop. Once one line is secured, remove the other line and properly feed it through the hoop. 5. Note that some mooring buoys have floats near the end, or in the middle, of the line that needs to be picked up. Often these floats are a bit of a distance from the actually mooring buoy. The forward crewmember needs to direct the helmsperson to a position where the floating rope can be picked up. Notice the orange/red float to the left of the mooring ball? That’s holding up the line you need to pick up with your hook. Not ally mooring balls are set up this well! 6. It can be advantageous to back into a mooring buoy instead of going bow first. The same set-up and directions apply however it’s easier for the helmsperson to see and it’s easier for the crewmember to simply grab the buoy line out of the water. Care needs to be taken in relation to any ropes getting caught in the prop and the crewmember needs to be careful not to fall in the water! 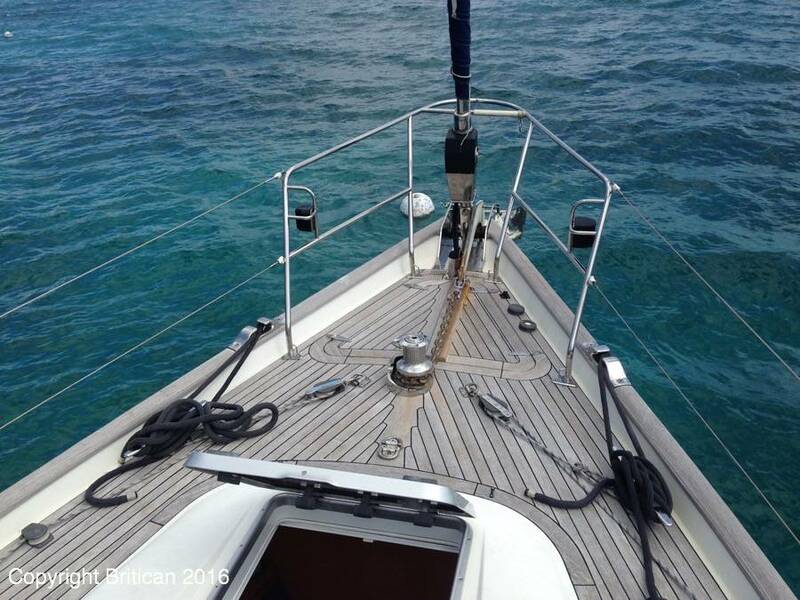 An added benefit of picking up a mooring buoy from the stern is that the wind will blow through the cabin providing more fresh air down below decks. 7. In calm situations it’s possible for the boat to bump into the mooring buoy causing noise and possible damage to the hull of the boat – especially on colored hulled boats. If this happens you can affix a third line from the bow of your boat through the top of the mooring buoy, run it up through your anchor channel and attach it to your windless winch. 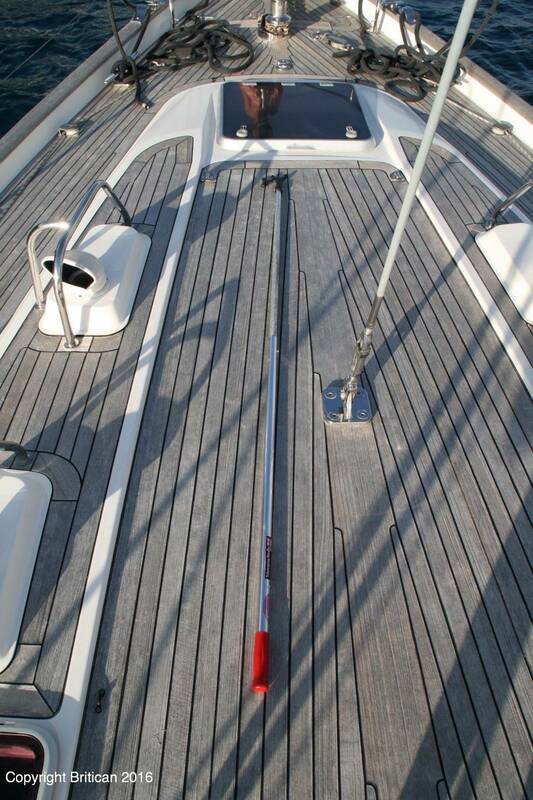 When you tighten the line, it will force the mooring buoy to stay clear of the boat. 8. In no-wind situations it’s very common for boats to swing randomly. When this happens there’s a possibility for collision. In other words, its possible for two boats to actually swing into each other – especially if there’s a mono haul next to a catamaran. When this happens, you can either leave the mooring field or sleep in the cockpit keeping one eye open. 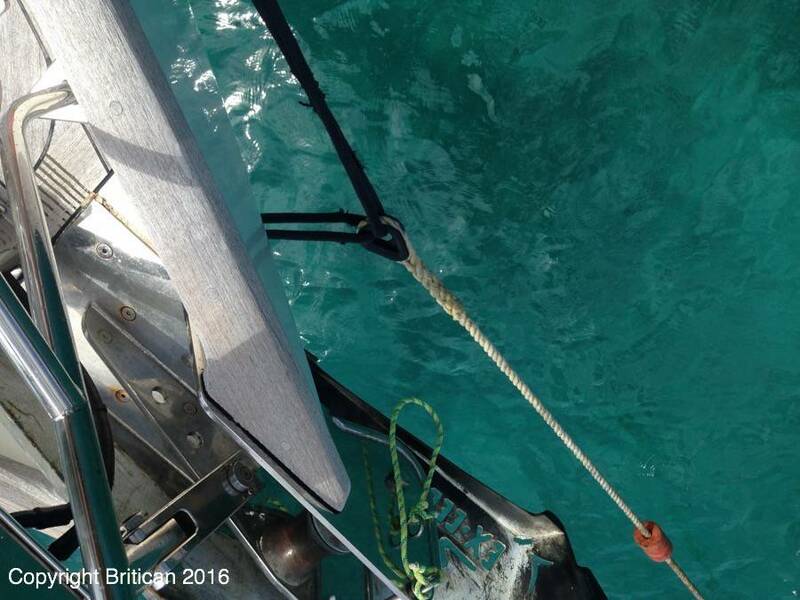 If boats hit each other it’s often just a little kiss but one time our bow hooked up with the bow of a catamaran and locked together! It took us a while to break the bond (the two boats were in love!). 9. When leaving a mooring buoy, there’s often a situation where the forward crewmember cannot get the line untied due to tension. If this is the case, the helmsperson needs to engage the engine and get closer to the mooring buoy. 10. Don’t use bow thrusters if there’s a possibility of a line being in the water when tying onto a mooring buoy. 11. NEVER leave the helm if the forward crewmember is struggling. It’s far easier to let the line go and try again than it is to rush back to the wheel to avoid a collision. 12. If you undershoot the mark, just engage the engine for a few ticks. If you overshoot the mark, just let the boat be pushed back with the wind and or current. If you totally miss the mark, make a big circle and do it again. 13. If help is provided in a mooring field, someone on a boat will come up to the bow. Hand the bulk of the rope (coiled) and the end of the line to the person and they will feed it through the mooring ball attachment giving it back to you to secure back on the same side. When you’re grabbing the first rope back, you can often give the helper the coil and end of the other rope or position it in a place for them to grab it off the deck. 14. Tying onto a mooring buoy can be hard work for new learners. If you ever see someone struggling, make sure to get into your dingy and head over to help them! Always pay it forward as you never know when you’re going to need help. Here’s the pole I use to grab the rope off the top off the mooring buoy. My shoulders are tight. There’s a knot in my neck so my side-to-side head motion is painful. When surveying the rest of my body I notice that my breathing is high in my lungs and shallow. I feel as if my whole upper body is scrunched up and fizzing with a tightness that can’t be released. 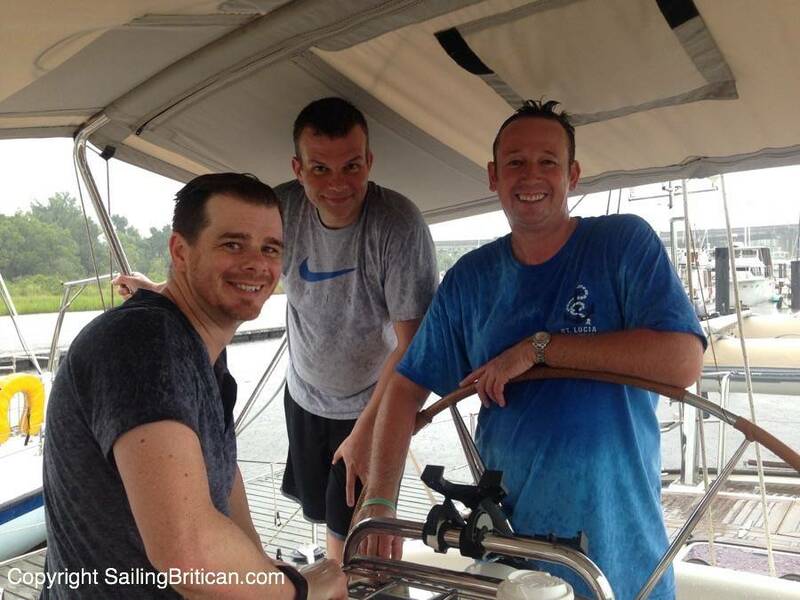 The last time I felt so stressed, my family and I were moving from land to sea boarding Britican for the start of our around the world sailing adventure. Now, over 2 ½ years after leaving land, we’re moving Britican from Wilmington, North Carolina, where she’s been on the hard being serviced, to Charleston, South Carolina, where we’ll be based until…who knows?! 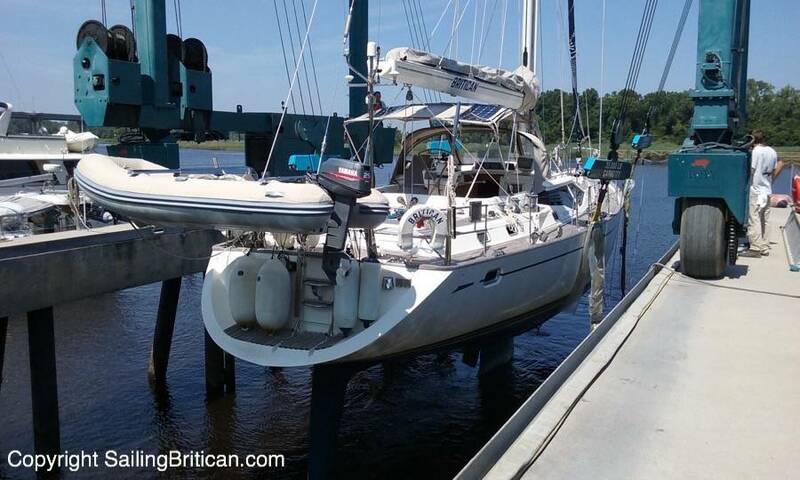 Let me back up a bit more….After sailing the Mediterranean for two years, crossing the Atlantic Ocean and sailing in the Caribbean for a season (December to June) we made our way north to North Carolina, USA to escape the tropical hurricane season. While my husband, Simon, and I discussed plans to find a hurricane hole along the east coast of America an idea popped into our heads. We thought it would be an excellent opportunity to put our six year old daughter into school. Up until the present time we’ve homeschooled our daughter, Sienna, and unfortunately it hasn’t gone as well as we would have hoped. Due to many reasons, homeschooling has become a time of anxiety, distress, screaming fits and, at times, family blowouts. Perhaps half of our lessons went well but the other half were painful. I’m sure there are many contributing factors that have hindered our success…perhaps the lack of routine, long passage sailing, our child’s temperament and our lack of training didn’t help?! Our initial idea was to put Sienna in school in America for three months so she’d get some sort of baseline understanding of what ‘normal’ school is like. Perhaps if an independent teacher showed her the way in addition to watching her peers do schoolwork she’d understand the importance of learning? As discussions ensued and practicalities became more and more complicated our plans expanded to possibly provide a full year of schooling for Sienna. The cost of staying in one place for a long duration is considerable. There are marina fees that reduce drastically over longer-term stays and the cost to buy a car rather than renting is less costly if done for a year or so. Other financial considerations also came into play. There’s a fantastic new marina that’s within walking distance to the city and it’s located in a lovely setting. 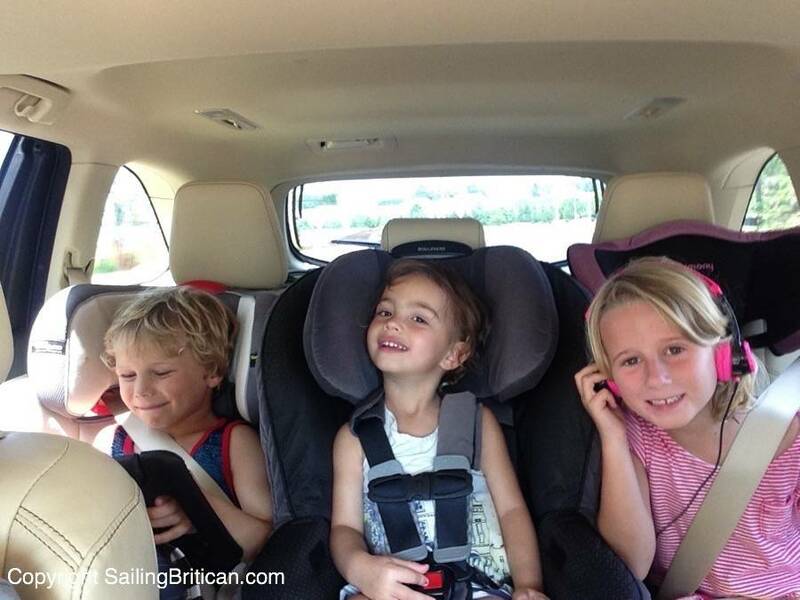 Additionally, my family would be a 2-hour drive from the boat. 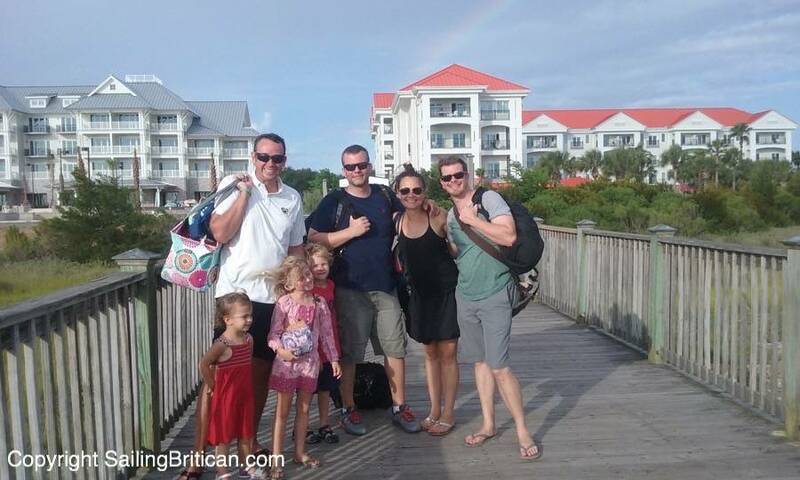 Sienna would have access to her grandparents, aunt, uncle and cousins! Unfortunately, however, the school district and private school options in Wilmington didn’t work for us. The school districted to the marina area has a very poor rating and the private schools wanted a massive amount of money. One thing let to another and my husband and I started to look for schools along the east coast with higher ratings in addition to places for us to park our boat. We drove to a beautiful vacation town called Beaufort in North Carolina making enquiries for both a boat slip and good local schools. The schools were all rated very well however we couldn’t find a slip for our boat that ticked all the boxes. One marina was ‘safe’ yet it didn’t have any facilities (no bathroom, showers, laundry, etc.). Another marina had facilities but had a reputation for being destroyed or damaged every time a big storm came through. In other words, if a hurricane was on its way we’d have to move the boat out of the marina, anchor her in a river, get off the boat and hope for the best. We couldn’t leave the boat in the marina! Although hurricanes rarely hit North Carolina, I just didn’t feel comfortable with the possibility of having to motor our boat into a river and anchor it with loads of other boats having to do the same. What if our boat dragged? What if someone else’s boat dragged? For us, it’s not just our boat that might get damaged or lost – it’s our home! Not feeling comfortable with the options in Beaufort, I started to research Charleston, South Carolina as I knew that the city had larger marinas. 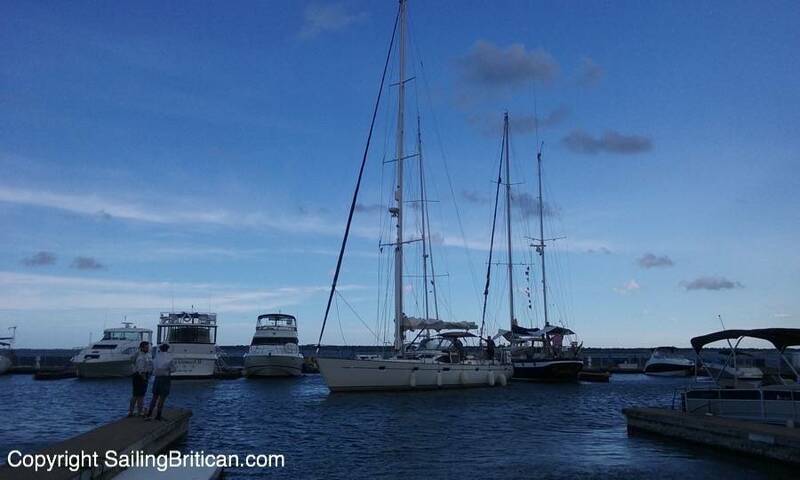 To our surprise, due to our 85’ mast and our almost 8’ keel our options are extremely limited. We assumed the the eastern coast of America would be a playground for larger boats but that couldn’t be further from the truth. 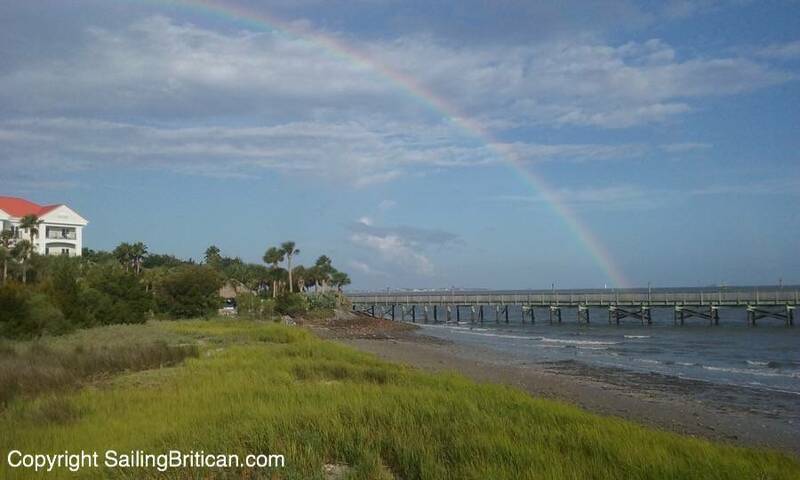 So…what about living on a boat in Charleston South Carolina? When I discovered that the public schools in Mount Pleasant, a Charleston suburb, had top rated schools Simon and I jumped in our rental car and drove four hours south to check it out. We found a marina called the Charleston Harbor Marina that’s facing Charleston but based in Mount Pleasant. We then looked up the school district for the marina and discovered that the school had a 10 out of 10 rating. RESULT! Feeling anxious we then had to get the marina to accept us as live-aboards, visit the school and get confirmation that they’d accept Sienna into the school and then work like mad to get Britican to the area before school started. Today, as I write this part of the article, it’s the 5th of August and Sienna’s school starts on the 17th! In an hour my mother is meeting me at my brothers house. My brother, husband, mom and I are then driving to Raleigh Durham Airport to pick up a friend. From the airport, we’re all driving down to Wilmington (2 hours) where mom and I will help Simon, my brother and a friend leave the dockyard. Mom and I will then drive home. While the boys are sailing 24 to 36 hours down to South Carolina, my sister-in-law and I will drive down with our three kids (my daughter, niece and nephew) to meet the guys. We’ll all spend the weekend checking out Charleston and then my brother’s family and friend will drive back north leaving us to get situated in our new home. Driving down to Charleston South Carolina with the kids. Can you understand why my stress levels are high?! I think that I spent my 20’s and 30’s reflecting on my negative American personal memories rather than the positive ones. The thought of going ‘home’ made me feel uncomfortable and thus I made up reasons why America wasn’t that great. Seriously…if you asked me three months ago if I’d ever move or stay long-term in America I’d come up with a whole host of reasons why I’d never stay. My largest argument was about the ‘live to work’ rather than ‘work to live’ ethic that many Americans have. In America you’re lucky to get a week off after you work for a year. In Europe you get twenty days off the day you start a job and then you get another 11 public holidays! Interestly, if I was ‘forced’ to move back to USA, I would never have considered the south! I’m originally from the North in America…we’re trained to think the south is not that great (not that I really believe that). Why the change of heart? Why do I now feel comfortable moving back to my country? After sailing around many third world countries, it’s amazing to come home to a country that truly has everything. There’s an abundance of food, entertainment and every kind of facility possible. When you grow up in America you don’t really understand how truly amazing this country is. It’s clean, the service is great, people are friendly, you can get anything you want at any time you want it…it’s nice to see that every toilet in a public place has a toilet seat, toilet paper and even soap! For over two years I’ve had to work hard to communicate in other languages, spend hours getting something as simple as milk (often long-life rather than fresh), or enduring extreme frustration when locating an Internet connection to work on my website and download homeschooling lessons. I’ve realized that I can’t do the homeschooling right now. I’ve exhausted all my resource and strength. I’ve never been one to say ‘I give up,’ but I am comfortable at admitting failure. To sum up my feelings quickly about homeschooling the best thing I can say is that I want to be a mom…just a mom. I don’t want to be a mom and a teacher. I can’t effectly handle both roles – I don’t know how. So…where better to get my daughter a good start with her education?! Sienna IS American…she has spent her first 3 ½ years in England and now she’ll spend a year or so in the States learning about the history, culture and the truly abundant opportunities that are presented here. Who knows if our stay in Charleston South Carolina will last one year or ten? Perhaps we’ll never leave South Carolina? Or maybe in a year we’ll continue on our around-the world sailing trip through to the Pacific Ocean? Maybe one year in school will teach Sienna the necessary understanding about what school is, why it exists and the benefits of an education? Perhaps she’ll be eager to get back out on the seas and start back with homeschooling? After the age of six, children in America have to be affiliated with an accredited homeschooling program that helps with the ciriculum, testing and routine correspondence. Perhaps if I’m armed with everything I need and Sienna is accountable to a teacher on land I might be able to simply be a mom that’s helping her get her school work done? Sailing and the sailing lifestyle has taught me that life is always changing and often it’s changing into something I could have never speculated about or imagined. I’ve seen many things, met incredible people and have learned to be more open about what the universe wants to provide. This situation is no different. From the practical side of things, our current plan is to live-aboard our boat in Charleston Harbor Marina while Sienna attends first grade. Hubby and I have a long list of boat improvements we want to make so we’ll work towards getting Britican to be even better than she is now. – Fixing several of our Gebo side windows. The knobs are disintegrating and falling off! – Changing all our ceiling screens/shades as they’re falling apart!